Ostuni is known as White City of Apulia because of its stark white buildings perched high above the plain below. Located about 5 miles and within sight of the Adriatic coastline, it has a year-round population of about 32,000 inhabitants, but can swell in the tourist season to over 100,000. Part of the province of Brindisi, a region with high production of both wine and olive oil. The town is a popular popular place for expats, especially British and Germans. The region around Ostuni has been inhabited since the Neolithic era, with Neanderthals living here over 40,000 years ago. The town itself was settled by the Messapii tribe, destroyed by Hannibal during the Punic Wars. It was rebuilt by the Greeks, its name deriving from the Greek Astynéon ("new town"). The town came under rule of the Romans until the Normans conquered it in 996 AD and built a medieval town around the summit of the 950 feet high hill, including a castle and four gates (ruins today). In 1507, rule passed to Isabella, Duchess of Bari, and under her rule Ostuni thrived during the Italian Renaissance, with an abundance of Renaissance architecture left behind. The white color of the town had practical advantages. Since at least the time of the Middle Ages, the lime whitewashing helped keep buildings cool by reflecting the heat of the southern sun. Lime whitewash also has disinfectant properties, helping to slow the spread of disease--this was proven during the Middle Ages, lessening the spread of the Plague. Lime is readily available in the surroundings of the city since the town itself is built upon three hills of Cretaceous limestone. The White City has become such a popular destination for tourists that the government pays for half the cost of homeowners repainting their homes every two years to keep them looking their whitest. The centro storico (historic center) is still fortified by the ancient walls. The town's largest buildings are the Ostuni Duomo and the Bishop's Palace, together with a number of palazzi of local aristocratic families. In the surrounding countryside there are typical Pugliese masserie (fortified large estate-farms), as well as trulli (pointed roofed structures), many of which today have been converted into hotels and B&Bs. Since 2010, there has been such a large influx of British expats buying properties, that the town has been given the tongue-in-cheek nickname of Salentoshire. La Processione della Grata - On the second Sunday of August, this procession leaves the Sanctuary della Grata to go to the center of the city and, and in the evening the candles of over six thousand people light up the countryside which can be viewed from the city's walls. Sagra dei Vecchi Tempi - Feast of the Old Times. August 15th is a local food festival with many traditional dishes. Cavalcata di Sant’Oronzo - a celebration of the town’s patron saint, takes place between the 24th-27th August. The high point are costumed knights and a procession on horseback. Just remember to bring your sunglasses if you plan on visiting Ostuni -- it's that white. Cyclists already know Lake Garda as a premier cycling destination, but the design and installation of a cycle path that hangs from the craggy cliffs surrounding the lake is going to be a real game changer. At a projected cost of over $130 million, Garda in Bici (Garda by Bike) is being constructed nearly 200 feet above the lake to complete an 86 mile route that circumnavigates the lake. The first three-mile section is set to open this summer, and the entire course should be completed by 2021 which will connect three Italian regions: Lombardy, Veneto and Trento. The area surrounding Lake Garda is already popular with cyclists who ride off-road trails in the Dolomites and with the grueling TransAlp Bike Race. The sleek steel and wooden route features elegant iron fences built as futuristic balconies with views of mountain peaks, boats sailing by and the picturesque villages that dot Lake Garda's shores. The engineering to complete the installation itself is daunting, at times using using helicopters, mountaineering experts and specialist riggers drilling into solid stone. Thick steel poles drilled into the cliffs support the board treadway, seemingly defying gravity. The addition of this amazing structure to the many biking paths that already exist around Lake Garda makes this a must-cycle destination. For more information about cycling in Lake Garda, Click Here. The Teatro Mercadante of Altamura began a new history in the Pugliese city in 2014 after 25 years of closure, thanks to the patronage by Altamura entrepreneurs. The beautifully restored classical Italian theater hosts a mixture of opera, jazz, classical comedies, Avant-garde performances, modern plays and philharmonic concerts. The theater is named after one of Altamura's favorite sons, Giuseppe Saverio Raffaele Mercadante (1795 -1870), an Italian composer, particularly of operas. After his death in 1870, the city of Altamura decided to build a new theater to honor his memory, starting construction in 1895 and finishing (amazingly) within six months! Originally, each person contributing to the effort, paid at least 5 lira which would represent "ownership" of the stage, a lamp, a door or a chair proportional to the amount paid. The interior of the theater is horseshoe shaped, consisting of four tiers of boxes and stalls with a capacity of approximately 500 seats, which results in there being no bad seat in the house. The historic curtain, entitled Mirabile, is the work of the painter Montagano, depicting Frederick II of Swabia and the construction of the Altamura Duomo. While Mercadante may not have retained the international celebrity of Gaetano Donizetti or Gioachino Rossini beyond his own lifetime, he composed as impressive a number of works. His development of operatic structures, melodic styles and orchestration contributed significantly to the foundations upon which Giuseppe Verdi built his dramatic technique. The Leaning Tower of Pisa sits in the sprawling Piazza dei Miracoli, but there are also other amazing buildings to visit and admire. Construction on the Pisa Duomo (the Santa Maria Assunta cathedral) began in 1063 by the architect Buscheto, paid for with the spoils received fighting against the Muslims in Sicily. The structure is a mix of architectural styles, reflecting the influences of the varied merchants of the day: classical, Lombard-Emilian, Byzantine, and Islamic. The church was erected outside Pisa's defensive walls to show it's lack of fear from outside forces. The cathedral was consecrated in 1118 by Pope Gelasius II, a member of the powerful Caetani family with links to both Pisa and Rome. The Duomo is well worth a visit and contains noteworthy treasures, including the marble pulpit and bronze doors, both designed by Pisano. The construction of the Baptistery of St. John (Battistero di San Giovanni) began in 1152 to replace an older baptistery, and was completed in 1363. The baptistry was designed by Diotisalvi, whose signature is found on two pillars inside the building, dated 1153. It is the largest baptistry in Italy, constructed with marble: 55 meters high with a diameter of 34 meters. It's architectural style is a combination of Romanesque and Gothic--the lower section Romanesque, the upper section Gothic. The interior, although somewhat overwhelming, lacks decoration. The octagonal font in the center was created in 1246 by Guido Bigarelli da Como, the bronze sculpture of St. John the Baptist is by Italo Griselli, The pulpit is from 1255-1260 by Nicola Pisano, father of Giovanni Pisano, who produced the pulpit in the Duomo. Built in the 13th century, the Campo Santo (Holy Field) Monumentale is a cemetery built in the form of a cloisters, sitting alongside both the Baptistry and the Duomo in the Piazza dei Miracoli. Admittedly, it is the lesser-known of Pisa's monuments. Legend claims it was built upon a shipload of sacred soil from Calvary where Jesus was crucified. It is said that bodies buried here will rot and ascend to Heaven in just 24 hours. The burial ground lies over the ruins of the original baptistery of the church of Santa Reparata, a church that stood where the Duomo stands today. Over the centuries, the most illustrious citizens of Pisa have been buried in Roman sarcophagi and more modest graves. The walls were decorated with 14th and 15th century beautiful frescoes which were damaged during WWII air raids, and are still being restored today. Some of the best frescoes to see include the Triumph of Death, the Last Judgment, and Stories of the Anchorites. The cemetery itself is composed of three chapels: Chapel Ammannati is the oldest one; Chapel Aulla made by Giovanni della Robbia in 1518; and Chapel Dal Pozzo, which was commissioned by Carlo Antonio Dal Pozzo, the archbishop of Pisa, in 1594. Just to the left of the Porta Nuova entrance to Piazza dei Miracoli, and just beyond the ancient gates of Porta del Leone lies the Cimitero Ebraico, the historic Jewish Cemetery of Pisa, one of the oldest cemeteries in the world still in use. It is separated from Campo Santo itself by the medieval walls, framed by the Torre di Santa Maria, the Lion's Gate and Torre di Catallo. If it weren't for the walls separating the two cemeteries, visitors would instantly realize that fully two-thirds of the northern boundary of Piazza dei Miracoli is sacred burial grounds for two religions. In use since 1674, the current cemetery was preceded by at least three other Jewish cemeteries, all located outside the western walls of Pisa. The first official mention of the Jewish community in Pisa dates back to 859 AD, and thirteenth century engraved inscriptions can still be seen to the right of the Porta Nuova. Historians believe that the poorest people were buried at the foot of the walls with their names engraved on the wall, all at the same height. Tombstones in the cemetery are unusual in that they have Hebraic inscriptions on one side and Spanish or Portuguese inscriptions on the other. This is because they were descendants of families expelled from the Iberian Peninsula in the 15th century. They also are engraved with the date from the the Gregorian calendar and and the Hebraic date. Many tombs are broken or tilted, not unlike the Leaning Tower, because of the poor soil. In the older part of the cemetery, the stones are under tall trees, giving you the impression that you are well outside of the city limits and away from the tourist throngs. Another interesting aspect is the tombstones marking the graves of children who succumbed to the 17th century plague. You will also find the graves of Jewish soldiers who fell during the First World War, Jews who were victims of fascist violence, German killings and Nazi-Fascist persecutions. A plaque on the wall of the mortuary chapel in the center of the cemetery lists names of those who were deported and disappeared in the extermination camps are also remembered by a plaque on the wall of the mortuary chapel in the center of the cemetery. If you visit, leave some stones for their souls and for your own. To visit, contact the Jewish Community of Pisa. In the historic center of Pisa, Piazza delle Vettovagia's name describes its function... vettovaglie means provisions in Italian. Literally, its name means Supply Square. Unlike other town markets in Italy, which have only one day in which a piazza turns into a market, this Piazza becomes a local market each and every morning. Keep in mind, this is a market for where locals shop. Well worth a visit if you want to experience the real Pisa. Residents can buy fruit, vegetables and other food products. You will feel like you've been transported back to the Renaissance, surrounded on all sides by porticoes, the piazza boasting cafes, wine shops, butchers, fish-sellers, bakeries and spice shops. The Piazza is a great place to buy your provisions for the day, or for snacking or dining in a taverna under the portico. It is a particularly lively spot in the evenings where locals congregate, and because it is off the tourist radar, prices are more affordable. The Torre di Santa Maria is in the north-west side of the defensive city walls in the Piazza dei Miracoli and was constructed in 1155-1161. In 1499, during a siege by the Florentines, the tower was nearly destroyed and shortened to the level of the walls. It was reconstructed again in the 19th century. The walls themselves took nearly two centuries to complete, stretching nearly 4-1/2 miles with an average height of 36 feet, about 6 feet thick and are built using “Panchina” stone, a form of tufa stone. After years of restoration, visitors may now attend walking tours on the Pisa walls on selected days. The three-kilometer path affords views of towers and ramparts, where you’ll also walk over the city's four gates: Porta Nuova in Piazza dei Miracoli, Porta a Lucca, Porta San Zeno and Porta Calcesana. Generally speaking, the walls are open from April till September. At the time of this writing, the cost is 3 Euros. Parts of the walls are actually handicapped-accessible via elevators (for short sections of the ramparts). You should be able to by tickets at the same places you buy tickets for the Leaning Tower. The hours are usually from 11am-2pm and 3pm to 8pm. (Please check with the Pisa Tourism Bureau for current dates and times. This is Italy, after all). Click the map above to see it in high resolution. I mean, sure, the London Bridge has been in Lake Havasu City, Arizona since 1964... but it's the actual London Bridge, bought and paid for from England, stone by stone, rebuilt into a modern little town spanning a small man-made lake. But this "real Venice" in Vegas in the middle of Sin-City is all smoke and mirrors--plastic ones at that. Many who have been to the real Venice would tell Mr. Adelson, “You didn’t get the smell right”, (a compliment to Venezia). Venezia is real. It's history. It's gritty and more than just a little wet during the winter. You can get lost in its back streets in proximity and in time. Vegas is Vegas. It's for gamblers and posers or worse. It for shoppers looking for designer labels or tourist kitsch. It's a casino, a huge hotel and a shopping mall. It's for the lazy tourist. It's not for real Voyagers. In this Phony-Baloney Venice, a visitor can pull into the Doge’s Palace driveway and in one glance see St. Mark’s Square with its campanile, the twin columns topped by Saint Theodore and the winged lion of St. Marks, the Campanile, the Sansoviniana Library, the Ca’ d’Oro palace, and both the Bridge of Sighs and the Rialto. There are no driveways in the real Venezia. The Palazzo Ducale (the Doge's real name) has gondola slips just outside in the canal--no driveway. In the Vegas's Venetian Hotel, the gondoliers have to actually audition as singers and hired as entertainers. This is the primary concern when hiring a phoney-gondolier. In the real Venezia, gondoliers follow a 900 year tradition of fathers to sons (and recently, daughters), essentially being born into the profession. They have to take strict boating exams and are expert in both navigation and weather. Although some are know to have good singing voices, it's not a requirement to get a gondolier's license. In Vegas, their gondo-tainers wear walkie-talkies, boom microphones and perform on a schedule. In the real Venice, one has to wander, explore, take a gondola or water-taxi perhaps to other islands in the lagoon, or walk the back streets and canals to see all the mysteries and wonders the ancient city offers the real Voyager. That's what real Voyages are... a slow, purposeful exploration. Soaking in the light and smells and colors and tastes and sounds and textures of the environment. There's nothing phony about Italy or Venice. We suggest turning your back on places like these re-created phony vacation spots, including all things Disney, unless you have 4-7 year old kids. And even then, wouldn't you rather have your child experience walking in real dinosaur prints (yes, in Italy), seeing where real cavemen lived (Italy again), exploring real castles (everywhere in Italy), looking into the crater of a real volcano (Italy), seeing where real gladiators fought to their deaths (yep, Italy) and experiencing real snow-capped mountains (of course, in Italy)? And don't get us started on the authenticity of the food and the people... OK, and don't forget gelato for the kids. Come on... get real and get to the real Italy. In the baroque town of Caltagirone, Sicily, the main attraction is its ceramics industry. The name of the town derives from the Arabic word qal’at-al-ghiran, meaning Castle of Vases. There are ceramics everywhere you look... as tile murals on buildings, as signs, and in the many ceramics shops just waiting for a savvy Voyager to select a few special pieces to take back home. But the tiles also adorn its stairways, the most majestic being the Scale di Santa Maria del Monte, built in 1608. Start to climb the 142 steps and you will be reading the town's history, each step telling their stories on hand-painted ceramic tiles that clad each stair’s riser. There are many fantastic characters, battle scenes, landscapes and symbolic patterns. It's a wonder to think that the staircase was rebuilt by the town after being destroyed by an earthquake in 1693 which destroyed most of the town. The Scale is a symbol of the town's resilience and rightfully, was honored as a UNESCO world heritage site in 2002. When you arrive at the top of this kaleidoscopic ascent, you turn around only to notice that the steps' colors have disappeared, seemingly to allow you to focus on the wonderful views of the town itself with its Baroque architecture. With tiles and ceramics being part of the architecture of the town, anyone who loves colorful ceramics would love visiting Caltagirone. You can see wonderful tile installations in its churches and palazzi, the Majolica Bridge of San Francesco, as well as in the Giardino Villa Comunale, a well cared for public garden. Worth a look are elaborate balcony of Casa Ventimiglia in Via Roma and Palazzo della Magnolia, in Via Luigi Sturzo with its terracotta embellishments. Caltagirone is located 43 miles southwest of Catania in southern Sicily. 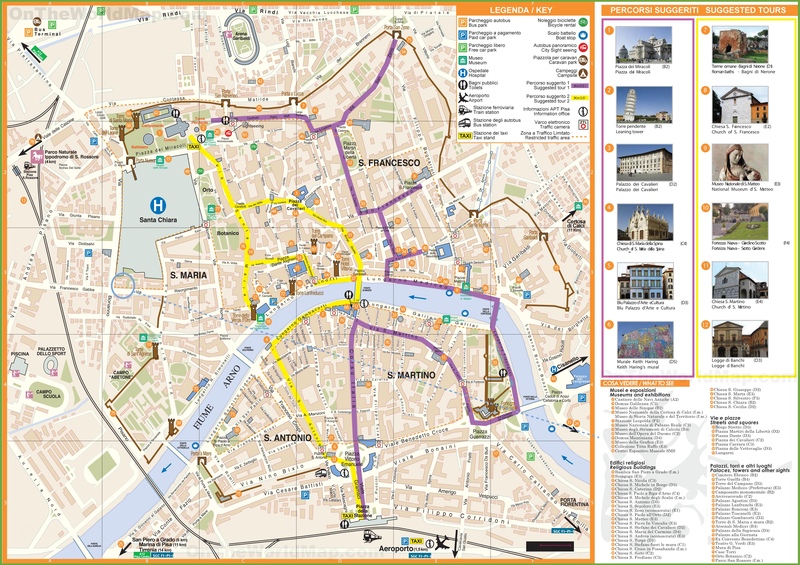 You can get there by bus from Catania but a car is recommended. Today the town thrives on tourists and ceramic collectors who visit over 130 ceramics studios and shops. The style of ceramics here is called Maiolica (Majolica) and is distinctively different from other areas of Sicily. Examples of Sicilian ceramic objects dating from prehistoric times to the present day. One enters the museum through the so-called Teatrino (Little Theater), a belvedere dating from 1792 with steps and its decorated balustrade. Castello Scaligero in the commune of Sirmione sits on a thin peninsula jutting out into the southern end of Lake Garda. Essentially, the ramparts of the castle function as a small fortified harbor for what was the Scaligera fleet. The castle has a de facto moat (the surrounding lake) and even a drawbridge through which visitors enter. There are 146 steps which take you up to ramparts of the walls which look down upon the little harbor. There is a small walkway around which bowmen would be stationed to ward off any intruders from the lake in addition to defensive towers. Castello Scaligero is perhaps the best preserved castle from medieval times in Italy, constructed in the middle of the 13th century on top of the remains of an ancient Roman fortress. Taking over a century to build, two courtyards and an other fortifications were also added. In 1405 the Republic of Venice took control and strengthened the castle even further. Sirmione Historic Center - After visiting the Castello, take a stroll around the old town of Sirmione. There are shops, restaurants, gelaterias, pizzerias and beautiful architecture. Be sure to take in a passaggiata (stroll) at dusk to Piazza Callas and its pier that juts out into the lake. Archaeological site of Grotte di Catullo - Ruins of a sizable Roman villa on a peninsula with an olive grove & a nearby archeological museum. Can get crowded in high season but worth a visit. Mantua & Peschiera del Garda - Mantua is a wonder town surrounded by manmade lakes which create a huge moat. Peschiera del Garda is a "water" town--surrounded on all sides by the River Mincio which connects to the lake. GVI Travel Tip: Best visited in the off season.